Yesterday I discussed Bitcoin’s position relative to its long-term downtrend angle. I also discussed the probabilities of it moving beyond that line and even higher according to a great number of time cycles coming in the next couple days. Finally, after 60+ days of a bear phase, a bottom formed rejection and then further buying support, all three of the major coins are now above their long-term downtrend lines. Price is above the 1-hour cloud, 4-hour cloud and 8-hour cloud. 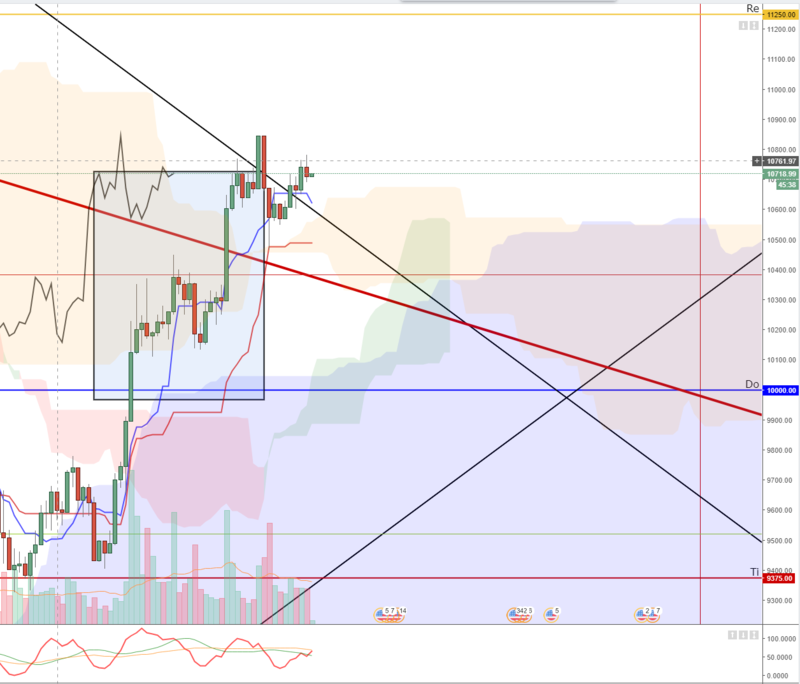 Price has found support on pullbacks to the Conversion Line and Base Line. The Lagging Span is above the 4 and 1-hour clouds. I want to point you to one other chart and type of analysis with Bitcoin before I move onto Ethereum and Litecoin. The blue arc (the top one) is one of the strongest resistance areas for Bitcoin to tackle. It has struggled to trade above it and has, instead, been trading inside of it and has even found support on the bottom of the arc. This thick vertical green line represents an acceleration of continuation. Basically, we move hard and fast off that time cycle. Ethereum has a fairly mute chart. The most important item on this chart is the orange diagonal line. That, like Bitcoin, is the long-term downtrend line. 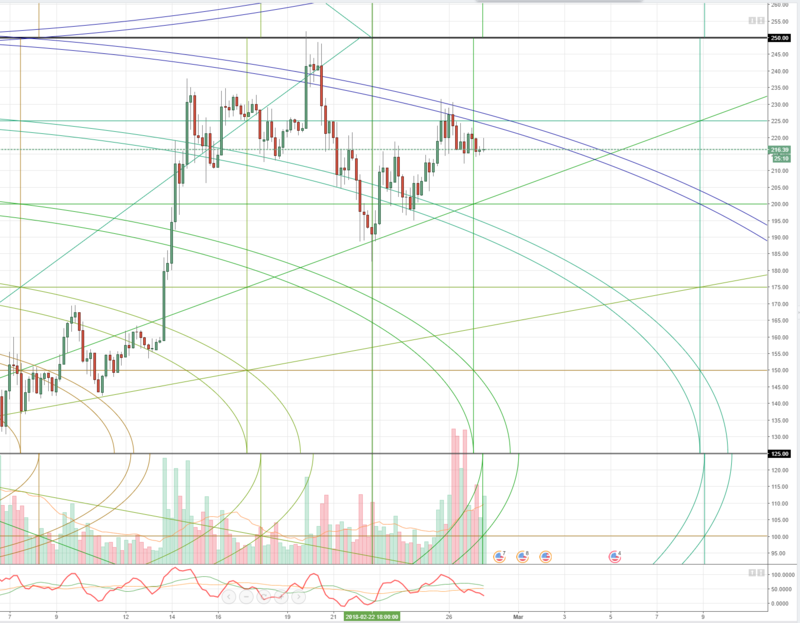 We are very extended away from it and that is bullish. We are sitting in the 875 price zone and we need to stay above that to be bullish. However, this large blue arc going from the top to the bottom of our chart is a heavy resistance zone. We should expect to see some difficulty getting through this zone. 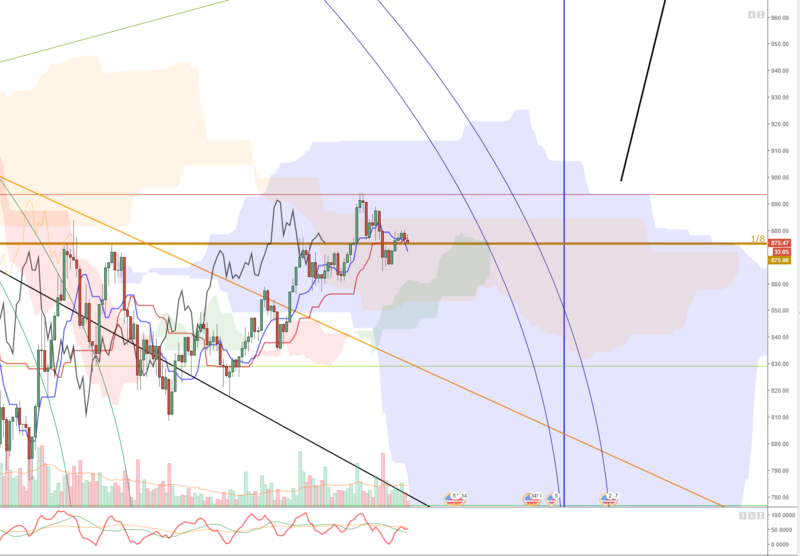 The Ichimoku system is also telling us that we have some consolidation going forward. The consolidation is evidenced by price being inside the 4-hour and 8-hour clouds. Litecoin has a similar structure and behavior to Ethereum. It’s in a somewhat consolidative range and is even forming a wedge (not drawn). However, like Ethereum price is trading near it’s farthest resistance arc (blue arc). Notice how price has been rejected off these areas, but also notice how much more shallow the moves go on each test. 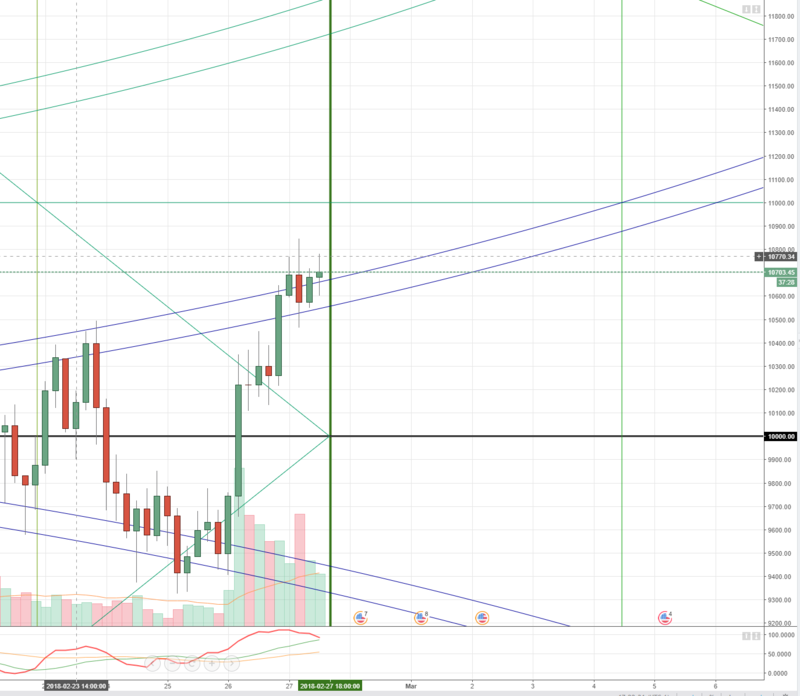 Litecoin is currently coiling for it’ own breakout from its current area. Expect to see much higher prices. A small pullback between now and all the way through the 28th of February should be a probability, but then it should be followed up by a long and heavy ride up. Again, the $12,000 value area for Bitcoin is a highly probable area for price to reach around the 2nd-3rd of March. Ethereum’s price should be the biggest mover out of the three, it has yet to display some strong bullish breakout structure like Bitcoin and Ethereum.